VueMinder can be downloaded in three versions, Lite, Pro, and Ultimate. The Lite version is free for non-commercial use, but lacks some of the more sophisticated features of the Pro and Ultimate versions. The Pro and Ultimate trial versions are free to download and are fully-functional for 30 days. Any data entered in the trial version will be automatically transferred to the purchased version. VueMinder is compatible with Windows 10, 8.1, 8, 7, Vista, and XP SP3. Non-commercial Use Only The Lite version is licensed for non-commercial use only. 30-day Free Trial The Pro trial version is free to try and fully-functional for 30 days. 30-day Free Trial The Ultimate trial version is free to try and fully-functional for 30 days. Sync with Microsoft Exchange and Office 365 VueMinder Ultimate can sync with Microsoft Exchange - either as a local server or a hosted server such as Office 365 Exchange Online. Most mobile devices can also support Exchange ActiveSync, enabling you to keep your mobile devices and VueMinder in sync. Send reminders via Microsoft Exchange The Ultimate version can send email reminders directly through Exchange Server, rather than requiring an SMTP server. This makes configuring VueMinder Ultimate to send email reminder much easier. Share tasks with other computers VueMinder Ultimate can share tasks with other computers. Task reminders, status, percent completion, priority, and custom data are also shared - making it easy to stay coordinated with your team. Share notes with other computers VueMinder Ultimate can share notes with other computers, allowing easy centralized access to important data regardless of which computer is being used. Share contacts with other computers VueMinder Ultimate can sync contact data between computers, which includes email addresses, phone numbers, mailing addresses, and more. Define custom data fields VueMinder Ultimate provides the ability to define custom input fields, enabling you to tailor VueMinder's capabilities to your exact needs. Share custom data with other computers VueMinder Ultimate can share custom data with other computers. When custom data is entered on one computer, that same data will appear on your other computers. The custom data could be almost anything you want to keep track of. Import and export custom data VueMinder Ultimate can automatically create custom fields when importing data that doesn't map to VueMinder's pre-existing input fields. This custom data isn't lost if the data is later exported from VueMinder. Text editor lists, tables, clip-art, more Event, task, and note descriptions can contain bullet lists, tables, clip-art, and more. This feature is only in the Pro and Ultimate versions. Sync with Google Contacts VueMinder Pro and Ultimate can sync contact data with Google Contacts and Google Mail. Sync with Google Tasks Automatically sync your tasks with Google Calendar. VueMinder Pro and Ultimate can sync 2-way with any number of Google task lists. Sync with Microsoft Outlook Sync the same schedule between Outlook and VueMinder. Outlook can also be used to sync VueMinder with mobile devices, in case you don't want to use Google Calendar. Share events with other computers VueMinder Pro and Ultimate can easily share event calendars between multiple computers and user accounts. Any changes made on one of the connected computers will instantly appear on other computers. Manage tasks Keep track of tasks. VueMinder Pro and Ultimate support tasks, sub-tasks, repeating tasks, tasks that float to the current date until completed, and more. Create notes Keep track of important information using the lightweight Notes feature. Notes can be pinned to dates and viewed in a list. View contact, event, and task lists VueMinder Pro and Ultimate provide a List view of events, tasks, notes, and contacts. The lists can be easily searched, sorted, filtered, and grouped. Wrap titles in Month view Unlike most other calendar programs where event titles will be clipped if too long to fit, event titles in VueMinder can optionally word-wrap, enabling you to see the full title. Link items with other items Events, tasks, notes, and contacts can be easily linked with other events, tasks, notes, and contacts. This is a revolutionary feature only available in VueMinder Pro and Ultimate. It allows many possible uses, such as keeping a history of client appointments. Excel import/export VueMinder can import events, tasks, notes, and contacts from Excel. This data can also be exported to Excel. Print additional layouts The Pro and Ultimate versions provide a large variety of print layouts and settings, rather than just the basic layouts provided in the Lite version. Customize event colors Event appearances in the Pro and Ultimate version can be easily customized with different colors, borders, font styles, background pictures, etc. These customizations will override the default calendar appearance. Define default reminder Default reminder settings can be saved and automatically re-used whenever a new event or task is created. Send email reminders Email reminders can be sent to yourself, other people, and distribution lists. Send SMS and voice reminders SMS reminders can be sent to yourself and other people. Attach files to events Files and documents can be attached to related events. The Pro and Ultimate versions can also include attached files in email reminders. Add background images to dates Add family photos, clip-art, and other pictures to the background of dates in the Month view. Save calendars as web pages VueMinder can generate HTML web pages, allowing other people that don't have VueMinder to still be able to see your schedule. VueMinder can also upload the generated pages to a web server via FTP. Subscribe to web calendars Many web-based calendars are available to be added to VueMinder, including calendars for holidays, sports, weather, and more. VueMinder provides an easy method for accessing these calendars. Import and export to ics files Data can be imported and exported using the standard iCalendar (ics) file format, enabling easy data transfer between VueMinder and most other calendar programs. Backup and restore data Your data is safe when using VueMinder, which provides an automatic backup feature. Overlay multiple calendars VueMinder supports any number of calendars. These can view viewed separately or overlaid into a single view with color-coded events. Formatted text editor Enter event descriptions using formatted text with different fonts, colors, sizes, and more. PrintableCal is a calendar add-in for Microsoft Excel, Word, and PowerPoint. It integrates with VueMinder (and just about any other calendar app) to enable customized printing of your schedule. With PrintableCal, you are able to print your schedule just the way you'd like, with logos, pictures, colors, contact information - whatever you want. You can even customize the calendar layouts and re-use those layouts again and again. Every layout will dynamically import your latest events, tasks, or notes - from VueMinder, Google Calendar, Outlook, or wherever else you maintain your schedule. 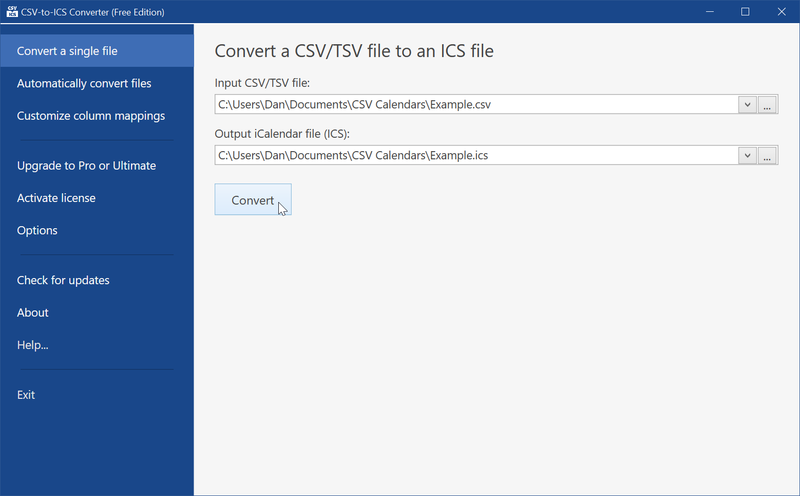 CSV-to-ICS Converter is a free tool for converting CSV files into iCalendar files. CSV files can be created using any spreadsheet editor or by exporting from a database. Many calendar apps are also capable of exporting data to CSV files. The iCalendar (ICS) format is a standard used by Google Calendar, Outlook, VueMinder, and many other calendar apps. CSV-to-ICS Converter enables data that is in CSV format to be converted into the ICS format for import into other calendar programs. What do you think of VueMinder? We'd love to hear what you think of VueMinder. If you have any other questions, please check the FAQ or the forums. You can also contact us directly.